Slice eggplants, salt them, and leave for 20 min so that they lose their bitter taste. Then rinse eggplants. Slice squashes, tomatoes, potatoes, and onion. 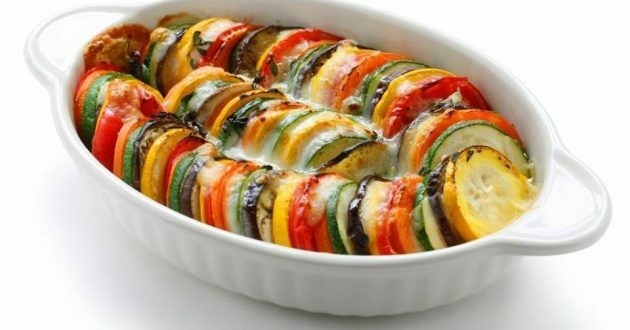 Arrange alternating different sliced vegetables on an oiled baking dish. Sprinkle with salt, pepper, greens, and garlic. Bake in the oven at 180-190 °C until potatoes are tender and eggplants skin becomes slightly golden and crusty. For a better crust experience, cover it with shredded cheese and crumbs.